This astronaut photograph highlights a portion of the Great Divide in the Rocky Mountains approximately 31 kilometers due west of Boulder, Colorado. The Great Divide is one of four continental divides recognized by geographers and hydrologists in North America—the others being the Northern, Eastern, and Saint Lawrence Seaway Divides—but it is still generally (and erroneously) known as the Continental Divide. The Great Divide is a hydrologic boundary defined by the ultimate destination of precipitation; rainfall on the western side of the Divide flows to the Pacific Ocean, while rainfall on the eastern side flows to the Gulf of Mexico. It is easy to visualize such a boundary traced along the high ridges of the Rocky Mountains (dashed line), but in regions of less obvious topography, more detailed study of the local geomorphology and hydrology are required to map the location of the Divide. This portion of the Rocky Mountains also hosts the Niwot Ridge Long Term Ecological Research (LTER) Site. Part of the National Science Foundation’s LTER program, the Niwot Ridge site is used for studies of climate interactions with tundra and alpine ecosystems. Niwot Ridge is visible in this image as a large eastward spur off the central spine of the mountains (center right). The entire Niwot LTER site is located at elevations higher than 3000 meters, and it includes an active cirque glacier and glacial landforms, tarns (glacial lakes), and permafrost. Lake Granby, located to the west of the Great Divide, is a reservoir on the Colorado River. It is the second-largest manmade body of water in the state of Colorado. Storage of water began in 1949. Today, the lake is popular location for fishing, boating, and camping. Astronaut photograph ISS018-E-5660 was acquired on October 28, 2008, with a Nikon D2Xs digital camera fitted with an 180 mm lens, and is provided by the ISS Crew Earth Observations experiment and the Image Science & Analysis Laboratory, Johnson Space Center. The image was taken by the Expedition 18 crew. The image in this article has been cropped and enhanced to improve contrast. Lens artifacts have been removed. The International Space Station Program supports the laboratory to help astronauts take pictures of Earth that will be of the greatest value to scientists and the public, and to make those images freely available on the Internet. Additional images taken by astronauts and cosmonauts can be viewed at the NASA/JSC Gateway to Astronaut Photography of Earth. Caption by William L. Stefanov, NASA-JSC. 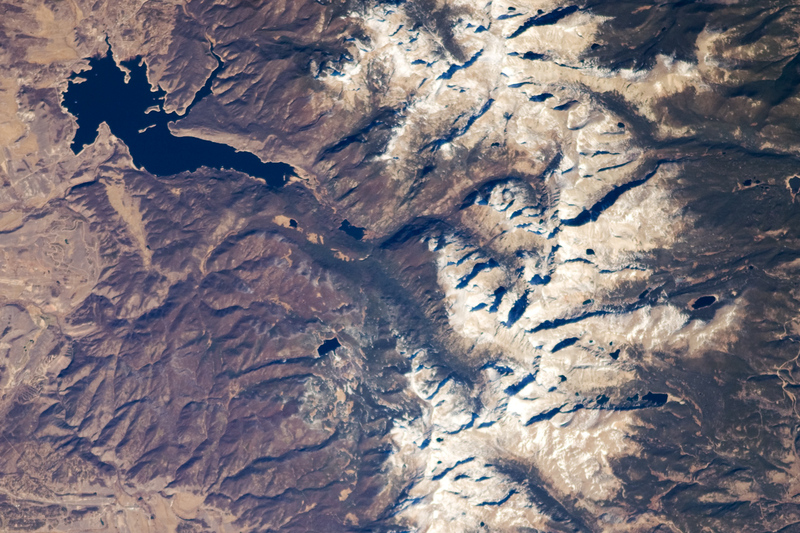 This astronaut photograph highlights a portion of the Great Divide in the Rocky Mountains approximately 31 kilometers due west of Boulder, Colorado.